Most Mac users are not aware of taking image of a DVD/CD. In the Disk Utility there is a option to create image file, but even though it creates .cdr format which only supports Mac. So we cannot share our image file with our friends who use other operating systems like Windows or Linux. Here I am going to show you a simple method to create ISO disc image (globally used image format) without using any third party apps. Really it is possible? Yes it is. Just using Disk Utility and Terminal, we can create an ISO disc image on Mac OS X. - Insert the CD/DVD into Optical Drive and wait for it loads. 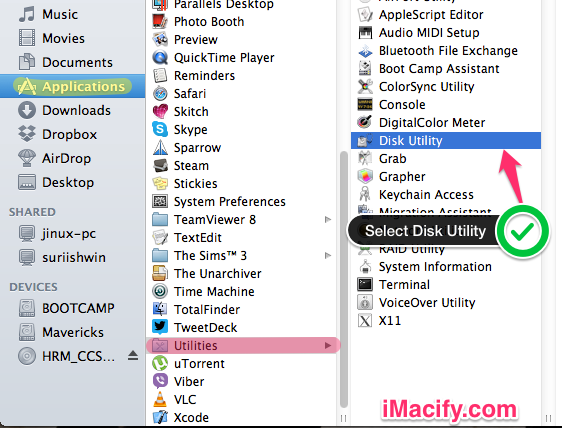 - After Disk Utility is loaded, you can see your disk is mounted in the left side bar of the Disk Utility. Select the Disk. - Now in the Popup box, In Save As text box, Type the Name of the image file as per your wish and select the place where to save the image file in Where section. - Select the Image Format to DVD/CD Master and Keep the Encryption option as None. Recheck the options, which should be like below image. Then hit Save button and wait till it saves the image file. - Tips: keep the name short and Save the file in Desktop or easily navigating folder, So we have to type easily again in conversion method. The output Image file will be in .cdr format. In Mac .cdr image works perfectly. However we have to change as .iso file format which is globally accepted by all operating systems. Now we are going to convert .cdr image file to .iso file image using terminal. So Now we are going to do something little bit typing in Terminal. ([filename] should be replaced with your file name of cdr file. Check below image.) and hit Enter/Return key. It will start converting. Now the terminal have converted your .cdr image file to .iso image file, which can be read by operating systems like Windows, Mac, Linux. This is the simple way to create iso image file from DVD or CD without using any third party apps. Now you can burn this iso to DVD/CD. To Mount this image just double click the file in Mac and In windows you need virtual drives to mount the iso image file.